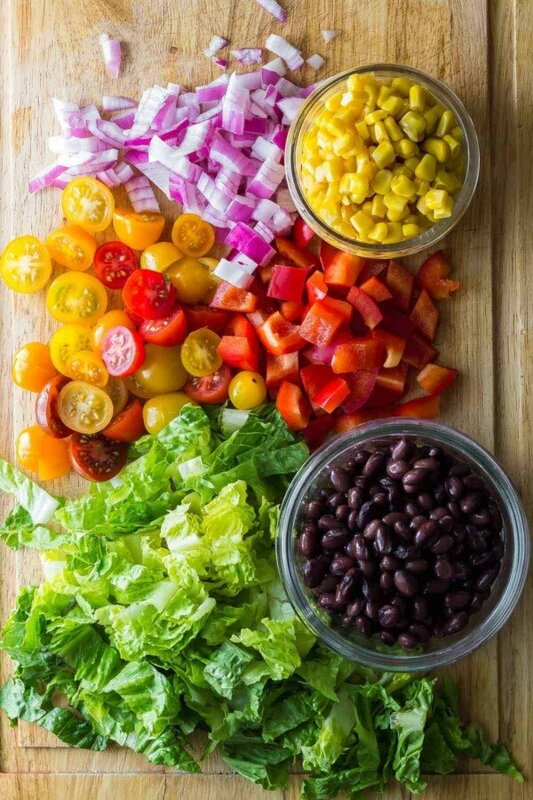 This southwestern chopped chicken salad is going to be your new favorite work lunch! Prep ahead on the weekend and when you’re ready to serve, drizzle with ranch and sprinkle with tortilla strips. I’ve been on pins and needles waiting for this week for four whole months…we are finally moving into our dream house this week! Because we had such a long closing date on our house, and haven’t set foot in it since March, it almost feels like a dream that we even bought it. I’ve been looking over the house brochures from when we viewed it last, and reminding myself that it wasn’t a dream, this is real life and this is going to be our forever home. I’ve been telling Ben for months that I will finally breathe a sigh of relief when all of the paperwork is done and we are sitting in our new home. I get happy just thinking about it! And I think a perfect dinner for our new house could be this southwestern chopped chicken salad, which also happens to be perfect for moving since it can be made ahead. Because after moving boxes all day, who has the energy to cook up a big dinner? Today’s post is in partnership with Litehouse Foods, whose Homestyle Ranch Dressing absolutely makes this southwestern chopped chicken salad. Ben and I are huge Litehouse Caesar Dressing fans, but after tasting the Homestyle Ranch, neither of us could actually decide which is our favourite. They are both creamy and so packed with flavour– the perfect dressings to stash in your fridge and jazz up a side salad, use as dip for veggies, drizzle on roasted veggies etc. 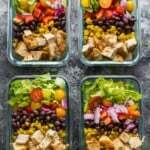 And for this recipe, the Homestyle Ranch Dressing is the absolute perfect compliment to the southwestern flavours of the chicken and all the veggies in this salad. Also the tortilla strips! 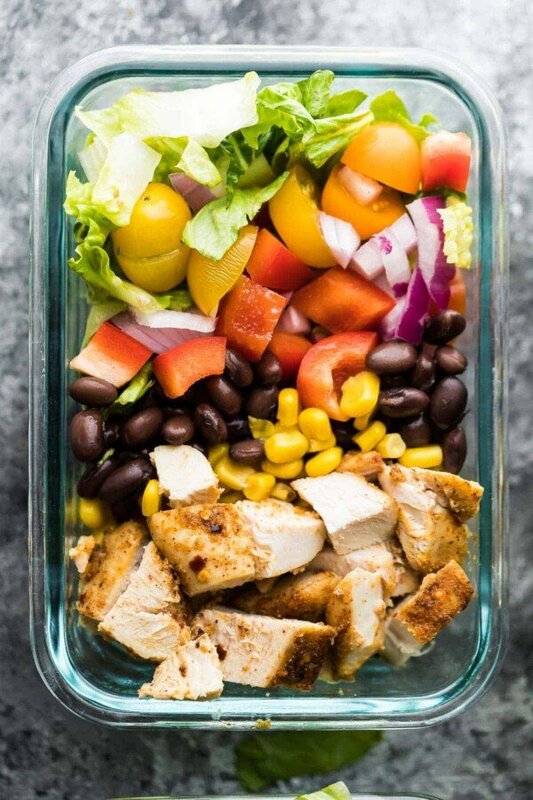 To make this southwestern chopped chicken salad meal preppable (is that a verb? I say so! ), simply keep the dressing and tortilla strips off until you’re ready to serve. This way, it will keep up to 4 days in the fridge. It is a filling but light salad that will get you excited for lunch hour, and keep you away from the food court. You can find Litehouse products in the refrigerated area in the produce section of your grocery store…cold is where it’s sold! Thank you Litehouse for sponsoring this post. As always, all opinions remain my own. this creamy cilantro lime dressing would also be great! 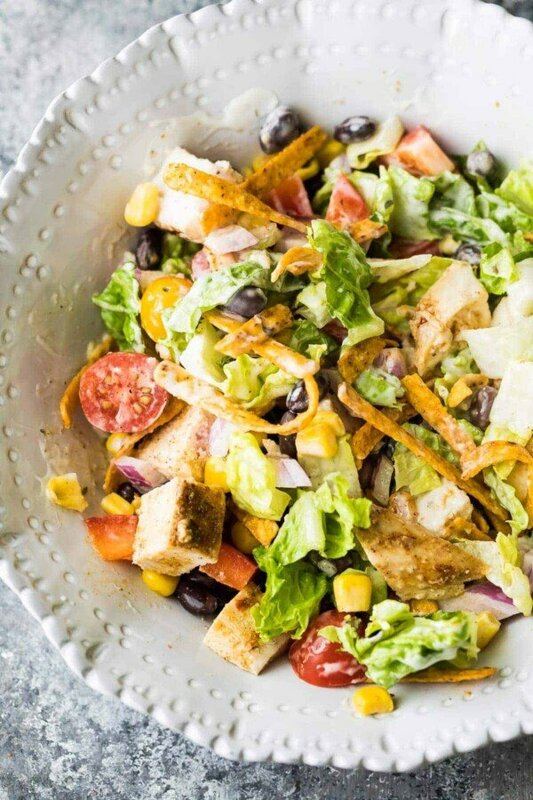 This southwestern chopped chicken salad is going to be your new favorite work lunch! Prep ahead on the weekend and when you're ready to serve, drizzle with ranch and sprinkle with tortilla strips. 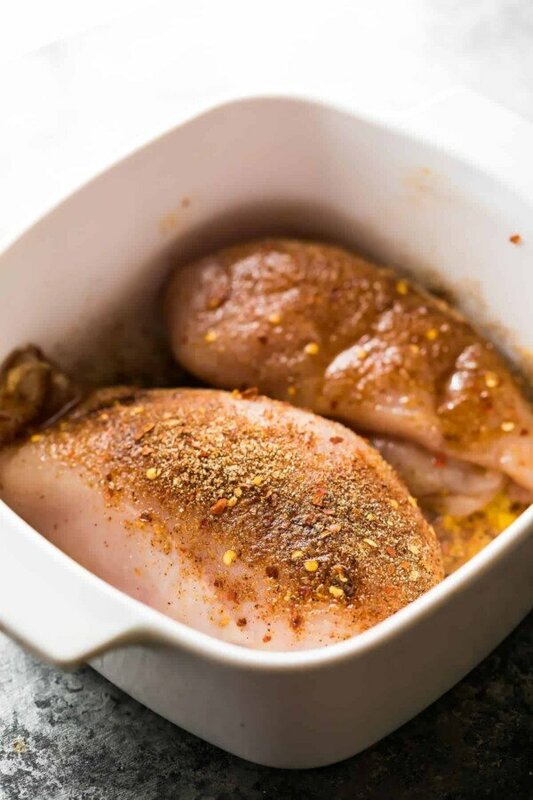 Place chicken breasts in a small baking dish and drizzle with olive oil. Sprinkle with spice mixture, turn chicken over and sprinkle the other side until coated. Bake in the pre-heated oven for 10 minutes, flip, and bake for another 10-15 minutes, until cooked through. Allow to rest at least 10 minutes before chopping into cubes. 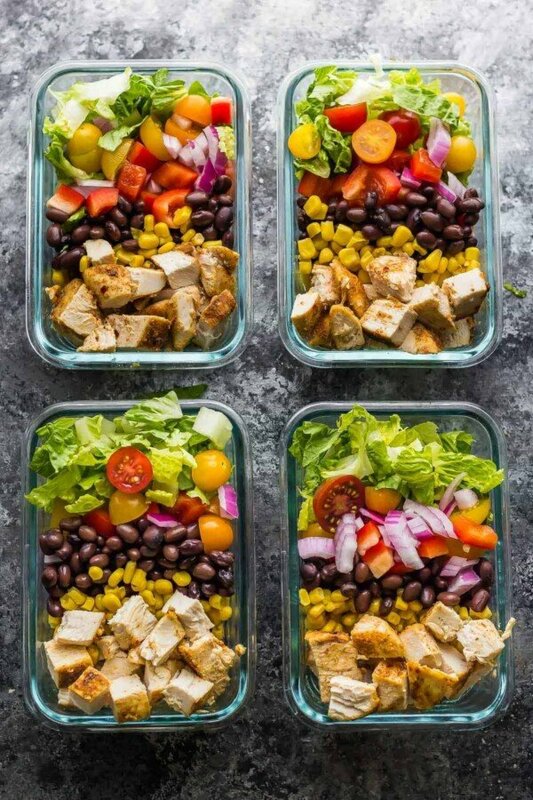 Divide all salad ingredients amongst four meal prep containers (2 cup capacity). Top with chicken. To ServeDump the contents out into a large bowl, toss with roughly 2 tablespoons of Litehouse Homestyle Ranch Dressing, and sprinkle with tortilla strips. Is the salad dressing sold at Walmart? I was able to find it on the Walmart website so I think it is! 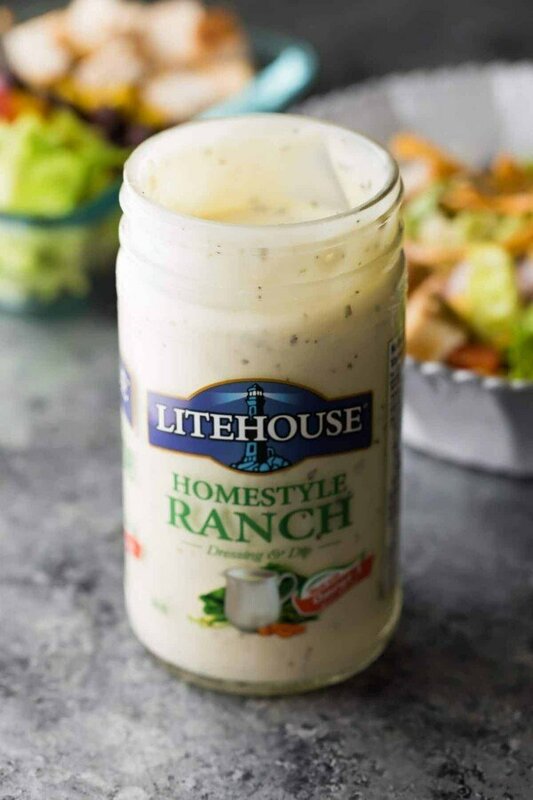 I love most of the Lighthouse dressings, but the Homestyle Ranch is one of my favorites. For something like this, though, I’d probably use their Jalapeno Ranch for a spicy kick! This is buy far the yummiest salad I have ever made. Ate it for lunch all week. So good. Wow, what a HUGE compliment! Thanks so much Adriana! I am definitely Team Caesar! No doubt, Team Ranch for me! I am Team Homestyle Ranch. Yum, I’d love to try this recipe especially since I’m Team Homestyle Ranch! This looks delicious! I’m Team Caesar! Team Homestyle Ranch! Ranch is AWESOME on salads to dip wings in. AHHH I am addicted. I’m team ranch all the way! Thanks for the recipe! I am Team Homestyle Ranch because I feel it’s a bit more versatile! I’m actually Team Blue Cheese, but given the choices I would pick Team Homestyle Ranch! Thanks! I am a Team Caesar! I use it as a dip too! Thank you for sharing your recipe! Looks delicious will try it with team Caesar! Great! I am Team Homestyle Ranch. Thanks! I am Team Caesar occasionally. But on a day-to-day basis, I’m Team Ranch. I love Ranch but I must admit I am Team Ceasar. I’m on Team Caesar. Love using it as a dip. Team Caesar, but I could be convinced to go to the other side. It’s a tough decision but I am going to go with Team Homestyle Ranch! It looks delicious. I’m on Team Homestyle Ranch! YUMMY! and oh so easy……only thing I left out was red onions (‘cos I packed it for work) bell peppers and tortilla strips (didn’t have any on hand). Just wondering what other dressing would you suggest? Yummy! Can’t wait to try the recipe as a meal prep for the week. I hope you enjoy, Sandra!